This past Thursday (October 26) evening kicked off with a cold wait in line for an almost sold-out show outside of Maxwell’s Concerts and Events on University Ave. Fans eager for a double header featuring Kelowna-native indie rock outfit, Yukon Blonde and Toronto-based folk trio The Rural Alberta Advantage. 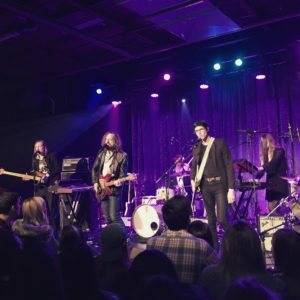 This was the fifth show in the first leg of the RAA/Yukon Blonde world tour, which will run its course with two sold out shows at Danforth Music Hall in Toronto on December 6/7. Both bands played with the fans in mind; which included a good mix of their new and old material, for which they are touring. As well as RAA, Yukon Blonde is promoting a new 2 song EP with the songs “Crazy” and “Emotional Blackmail”. This new material trends towards more dominant synthesizers and a slight Tame Impala sound, like on the track “Emotional Blackmail.” Yukon Blonde’s classics were anthemic and played to the delight of the crowd; these included “I Wanna Be Your Man”, “Saturday Night”, “Make U Mine” and “Stairway”. Looking at all their material, there is something to be desired when it comes to the song writing. One can notice a dominant theme of love and a never-ending feud between male and female character tropes. It just never seems to work out. With that aside, they did not fail to deliver a tight performance that reminded us who Yukon Blonde was. 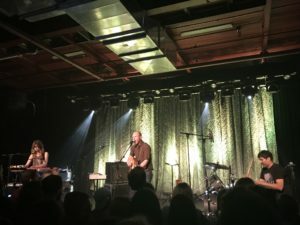 The Rural Alberta Advantage is charmisatically fronted by Alberta-born singer/guitarist Nils Edenloff, accompanied by Robin Hatch on the keys/bass, and Paul Banwatt on the drums. Promoting their freshly released album, The Wild, RAA did an excellent job of integrating tracks off the new record in their set seamlessly with old ones. The audience was filled with fans who shamelessly belted out songs with as much intensity as Edenloff himself. Highlights included crowd sing-alongs to new tracks such as, “Brother” and “White Lights”; as well as old favourites such as “Frank, AB”, “Tornado ‘87”, and “Vulcan, AB”. This left the crowd’s hearts bursting and souls soaring. Despite an established sound and 4 full length studio albums, it seemed that after an hour of playing, songs began to mesh together and sound similar. It can be said that the RAA found their sound in debut album, Hometowns (2010), but the albums following don’t show many signs of variation or experimentation. After playing a full set the RAA came back for an encore, which was kicked off by Edenloff playing a solo rendition of “North Star”, and ended strong with “Terrified”; for which they somehow had enough left in the tank to perform quite possibly their loudest song of the set. The RAA put their heart and soul into this performance and it was clear that they are passionate about their music and their fans. We’d like to thank Maxwell’s for hosting the event and the live efforts put forth by Yukon Blonde and the Rural Alberta Advantage.